Enjoy your Hawaiian vacation in one of Kona's most popular complexes. Casa is very well maintained with beautiful gardens and an awesome ocean-front salt water pool. We are steps from the ocean and have a wonderful sunset view from the lanai. Unit 201 is easily accessible with parking close by. The unit is open, clean, and comfortable. There's tile floors through out and new appliances and furnishings. A full size washer and dryer are in the unit, saving you time and money doing laundry on your vacation. The private, extra large lanai offers a dining area as well as sun bathing. We sleep 3 adults or up to 4, including children. Casa is located on the Ocean side of Alii Dr.
Clean and well stocked. Bed was not very comfortable. The condo and complex were wonderful. The daily construction outside? Not so much. This condo in Kailua-Kona had every amenity, which should have provided a comfortable place to stay for our four days in Kona. To anyone reading this review, under normal circumstances, this apartment would be lovely. The condo itself is not near the water and a beach is not accessible from the complex itself, but it's just a short walk to the back of the complex to lovely sandy "beach" area where one can sit on sand, listen to the waves on the rock shore, or view beautiful sunsets. It also has a regular pool and a beautiful saltwater pool overlooking the ocean. However, during our stay, the complex was completing a construction project. Right outside our window. The jackhammers and the beeping of trucks started at 7:30 a.m. each and every day we were there and didn't stop at any time during the day, except when the workmen stopped for lunch. Of course, most of the time, we were out exploring, but if we wanted to sleep in or come back for some peace and quiet during the day, it was not possible. Plus, we had to accommodate the water being turned off for construction for one morning during our stay. The evenings, however, were quiet. So, our stay was not as pleasant as it could have been, but without the construction, this apartment is lovely and we would have had a five-star stay. Simply ask the manager before you book whether any construction is planned on the property, especially in the front of the building where the condo is located. 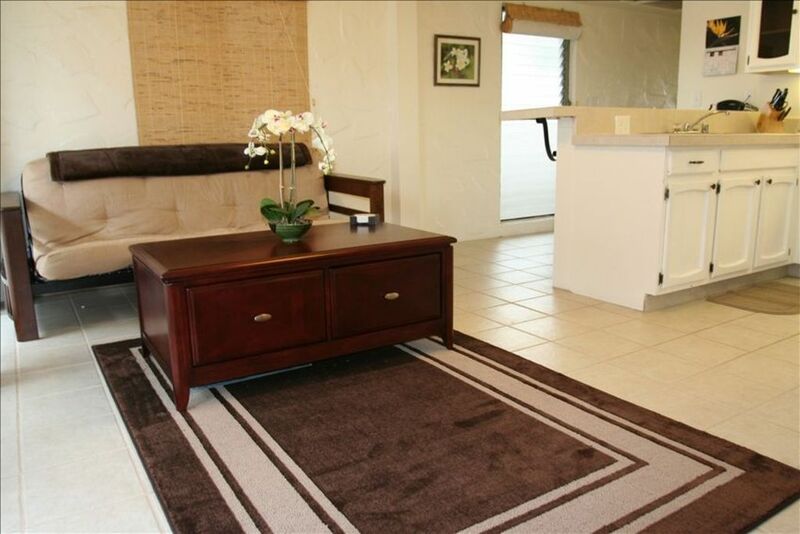 The condo is centrally located in Kailua-Kona and easy to access local beaches and stores. We absolutely loved the salt-water pool and the wonderful ocean views. It is a cozy one bedroom, but it has all the amenities you could ask for. Plenty of kitchen and refrigerator space; coolers, towels and beach gear along with a washer and dryer. The owners have really made your stay easy and they were easily accessible if you had any questions. We left behind a supply of paper products, utensils and a massive bucket of beach toys to pay it forward to the next guests! Mahalo for your hospitality! It’s in Kona, how could it be bad? Most of it was very pleasant. Bedroom shades do not open and sill hadn’t been dusted/cleaned for a very long time. Property was as listed. Location was ideal, very close to Kona Village and eateries. The check-in/out instructions need to be updated because they're not consistent. While the app instructions said one thing, the confirmation email said another, and then written instructions inside the property listed something different. The balcony provided a good view to watch the sunset. It was a very quiet condo complex which we greatly enjoyed. Cons we had was the cleanliness of the shower, the room was not prepared prior to our arrival, a load of laundry was left in the washer and we didn't realize it until the next day and it had to be rewashed because it started to smell. What bothered us the most was receiving a message from the owner about her getting a violation from HOA for towels hanging over the balcony (which we were instructed not to do) and she reminded us not to do this. I let the owner know it wasn't from us but from the unit above us and she was provided a picture showing this but she never apologized for the mistake even when I let her know I talked to the property manager about it. I wanted to ensure the confusion was cleared up because I didn't want to be charged for violating the rules. Better safe than sorry. I recommend this property for the location and if you'd prefer to not have communication with the owner.